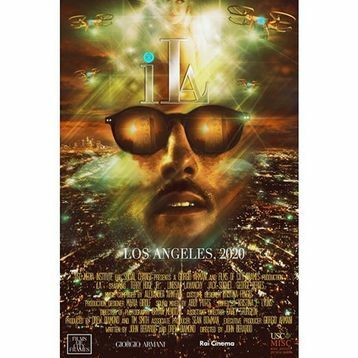 I caught up with director John Berardo to discuss his latest project, iLA—one of the six films created for Giorgio Armani’s Films of City Frames. What was the inspiration for the film? One of the prompts that Armani gave that we had to go by was tell a story of [your] city through these frames; this eyeglasses line they have called Armani Frames of Life. I’ve lived in LA for 10 years. I feel like I've gotten some of the best parts of the city and some of the worst parts of the city. It's a city of the future and a city that is building towards something. Especially if you look at the history of the city, it’s been so corrupt. It’s a dangerous city to live in. It's where noir originated. I wanted to show not a scifi version of it [...] We didn't even think genres [...] We had to show what our city was like through these frames that the main character wore. Almost like the glasses being one's companion through the city. Did you get to pick out which glasses to feature in the video? I did, from The Frames of Life glass line. We were sent about fifteen different pairs and we could pick whichever one we wanted […] They were also very specific saying the movie isn't about glasses it's about the character that wears glasses. We didn't make the movie about magical glasses or glasses that you suddenly saw the truth or something like that. They were very conscientious that we did not cause too much attention to the glasses. They looked the best on the actor [..] Also LA to me is the one city where you can freelance as a paparazzo and all you do is chase around celebrities because they’re everywhere here. I wanted to play with the idea of not giving paparazzi a bad rap. I wanted to give it a vigilante feel […] When he put on his glasses he became this sort of vigilante paparazzo. So I wanted to make sure he had sunglasses and regular glasses. I wanted them to be the same style. We actually had to ask Armani to give us different lenses for the glasses because we wanted to make a pair of the regular glasses look like sunglasses so they were almost identical. And then we added a polarizer effect to the glasses at the beginning of the movie. Can you tell me a little about the costumes? Armani was very specific about not wanting to have Armani clothes in the film. […] Our costume designer, Kristina Fenske, wanted it to look very simple and she didn't want to go too crazy. There are no Armani outfits in the actual story. She tried to find something that looked kind of like Armani for that final scene. And what about the classic Hollywood mixed with scifi? Armani's got that very classic, clean, gold, black and white feel to it and we wanted to do that with a futuristic sense; a clean simple feel that really sort of impacted and creates something really cool with classic Hollywood red carpet paparazzi [...] Our inspiration for the celebrity was not Classic Hollywood. It was Lana Del Ray. She has a very sort of LA feel, especially her older image from her Born to Diealbum. If you look at some of the details, she has very long nails, jewelry, a lot of tattoos. The VFX…but I knew that we could do it. The biggest thing was making sure all of our pre-vis was very specific. Within the script I had to break down what would be VFX and what would not be. The Production Designer (Maria Dirolf) and VFX Coordinator (Greg Jones) had to work together really really closely […] We didn't film at The Chateau Marmont, we filmed at USC. We had to make it look like the hotel. That was a team effort between production design and the effects. Once we had a cut of the film, what I had to do was Photoshop mockup what the VFX would look like. From there I had to submit that to Armani. That was probably the most time consuming part. Once we picture locked, the VFX artist took all the effects […] It was like working on an animated film. [The team] had no idea what it was going to look like but they had somewhat of an idea. Our editor Kristina Lyons was cutting and editing blindly because the VFX weren't done yet. Any fun or interesting stories from filming? We filmed in three days so it was like a freight train. It went from beginning to end so fast. The beach scene was probably the most interesting because the entire crew had to climb over these rocks to get to this little cove we wanted to film in. When we scouted the location there was nobody in that cove. But when we went to film there, there were so many people […] In reality there were people everywhere. We had to hide them, push the to the side. The magic of movies. Also a lot of people were amazed by the drones. Because we can't fly drones outside we had to comp them in [...] We had a club of drone pilots literally come to set with these drones and toys and show everyone how to use them. It was definitely a learning experience. I've been working with the USC Media Institute for Social Change, founded by Michael Taylor (executive producer of iLA) and we have a couple projects coming up. One is a PSA for Save The Children's early childhood education initiative] and Jennifer Garner is funding it so I’m pretty stoked about that. I have my short film Dembanger, which my co-writer Brian Frager (a USC alum I started Shatterproof films with) and I are packaging as a feature. So we're trying to get that off the ground. I’m also possibly going to be directing some videos for the Tesla Foundation about how drones could be used for good.